The best portable sawmill in world is worth nothing if it’s not equipped with a good, sharp blade. To start to understand band blades, it’s important first to first understand their anatomy. Good blade maintenance is critical to making smooth cuts and to prolonging blades life. Blades should be changed at least every two hours of operation. 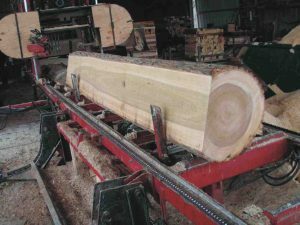 Experienced sawyers who mill commercially all day, every day, will often change their blades even more frequently – as many as 4 to 6 times per day. Settle on a blade sharpening strategy that will work well for you. You CAN’T Sharpen by Hand – Sharpening by hand is not an option. Even if you’re a whiz at sharpening chainsaw chains, sharpening band blades by hand won’t work. They have to be profiled accurately and uniformly otherwise they will wave in the cut. Precise, automated equipment is the only way to achieve. 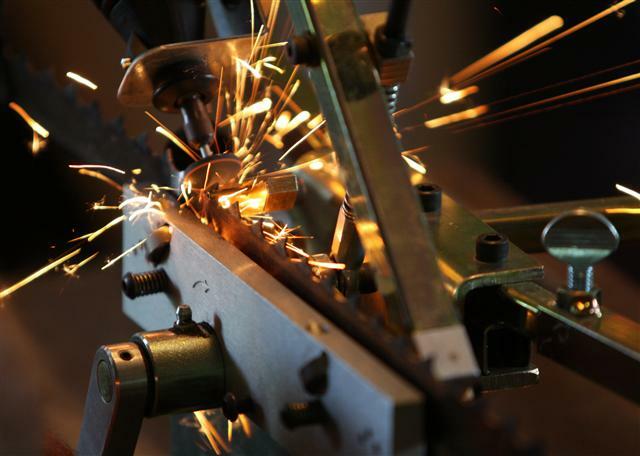 Blade “Tune-Ups” Involve Sharpening & Tooth Setting – A full blade “tune-up” involves sharpening the blade (grinding material off) AND setting the teeth (restoring the distance that the teeth are offset from straight). gullet. Profiling a blade involves sharpening the entire blade profile – the face, the back and the gullet. The advantage to profiling the entire blade profile is that, in addition to sharpening the blade face, you also remove tiny microscopic cracks that, if left unchecked, get bigger and eventually cause the blade to break. Setting the Teeth – Once the blade is sharpened, the set of the teeth should be checked and, if necessary, adjusted. As with the sharpening process, you can’t do this by hand; you need precise equipment. Even with specialized equipment, setting can be a time-consuming process, so many people set their teeth once every few sharpenings. Depending on what you’re milling, putting off the setting this way can work out okay. I should note that some people believe in setting their teeth before sharpeneing. Blade maintenance is an art and there are good reasons for both strategies. You will have to find the strategy that works best for you. (2) Send out your blades to a blade service. a. Time: A full tune-up on each blade takes anywhere from 5 to 10 minutes. On the other hand, coiling and repackaging your blades, taking them to the courier office and picking them back up can take time too. b. Money: A full tune-up typically costs anywhere from $9 to $14 per blade, plus shipping costs. On the other hand, blade maintenance equipment can cost anywhere from $1400 to $2500. The cost of paying to have someone else maintain your blades can add up really fast if you plan to mill a fair bit. But if you plan to mill only a couple days a year, investing in your own equipment may not make sense. c. Quality: Some blade services don’t do a very good job while others do know what they’re doing. Either way, you have no control over how well they do their job. On the other hand, if you look after your own blade maintenance, you have complete control over the process. 2. Photo credits: Norwood Sawmills web site.